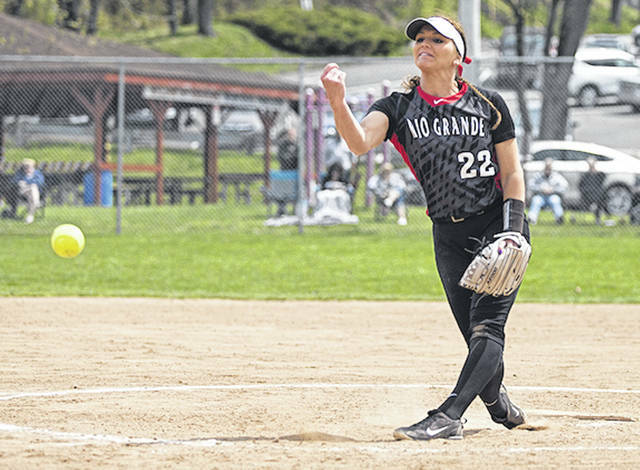 Rio Grande’s Kelsey Conkey fires a pitch plateward during Saturday’s game one win over Point Park in Kennedy Township, Pa. The senior right-hander tossed a three-hit shutout in the RedStorm’s 2-0 victory. KENNEDY TOWNSHIP, Pa. — Kelsey Conkey tossed a three-hit shutout, while Lexi Philen and Michaela Criner clubbed solo home runs to give the University of Rio Grande a 2-0 game one win over Point Park University, Saturday afternoon, in River States Conference softball action at Fairhaven Park. The host Pioneers handed the RedStorm their first conference loss in the nightcap, rallying for a pair of sixth inning runs to record a 2-0 victory. Rio Grande finished the day at 25-11 overall and 13-1 inside the RSC. Point Park moved to 16-15 overall and 9-5 in league play. Conkey, a senior from Minford, Ohio, picked up her 10th win of the season by scattering three singles and a walk in a complete game effort. The right-hander authored her fourth shutout of the season and her nine strikeouts represented a season-high. Philen, a junior from Tallmadge, Ohio, provided Rio with all of the offense it would need in the first inning by hitting her first home run of the season on the eighth pitch thrown by PPU starter Ashley Iagnemma. That’s how things stayed until the fifth inning when Criner, a junior from Bremen, Ohio, hit a two-out solo home run – her seventh of the season – to extend the lead to 2-0. Iagnemma suffered the loss for the Pioneers despite allowing just four hits and two walks in her own complete game effort. She finished with six strikeouts. Game two was a pitcher’s duel between Rio sophomore Raelynn Hastings (Commercial Point, OH) and Point Park’s Katie Tarr. The contest remained scoreless until the Pioneers parlayed a trio of two-out singles into a pair of runs. Tiffany Edwards and Taylor Goldstrohm drove in the PPU runs. Tarr kept the RedStorm offense in check, retiring the first 13 batters she faced until freshman Taylor Webb (Willow Wood, OH) doubled with one out in the fifth inning. Rio’s only other hit was a one-out single by freshman Kenzie Cremeens (Ironton, OH) in the seventh inning, but Tarr struck out Conkey and Webb – both of whom represented the tying runs – to seal the win. Tarr finished with 13 strikeouts in the victory, while Goldstrohm and Maddie Horn finished with two hits each. Hastings was the hard-luck loser for the RedStorm, allowing eight hits and the two runs in a complete game effort. She also struck out two.